Many years ago, before stretch marks, I had a painting business in Los Angeles. I found old discarded furniture and spruced it up with a little decorative painting and then sold it in hoopty ploopty Melrose Street type stores for a tidy sum. And by tidy, I mean I would holler at perspective customers I CANNOT BELIEVE THE PROFIT I’M MAKING ON THIS $2 TABLE. In reality, a lot of love and care went into my work. I thanked God every single day for a job that I absolutely adored. At Christmas time, I would add small gift items to my offerings for sale. 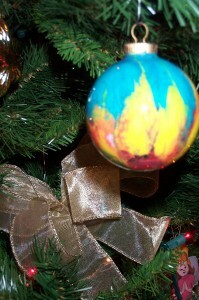 Among my favorites were handpainted Christmas ornaments. I found clear glass ornaments at craft stores (usually found on sale AFTER Christmas and I would save them). Then, using different colored water based paint, I would pour a little into the ornament and swirl the paint around to create random designs. When the interior of the ball was coated, I placed them upside-down in an egg carton to drain and dry. When I was certain they were dry (usually a few days) I placed them in a pretty gift box lined with tissue paper. These made beautiful little gifts. And no two were ever alike. I decorate “my” tree with these ornaments. As opposed to the “kid’s” tree which is adorned with all manner of Disney Princesses and Hot Wheels Cars. If you’re looking for some really terrific handmade gift ideas, head over to We Are That Family and check out Works for Me Wednesday. so funny that you posted this. We just made these ornaments two days ago. Since there is NO humidity here in CO, I thought they were dry and we hung them on the tree. Tonight, RockyA noticed that some of the ornaments had bare spots where the paint had sloshed down and pooled in the bottom. Then RockyDaddy commented that, they had not actually “dried” out on the deck where I left them until assembly. they had FROZEN out there, and then thawed once hung in our cozy home. But I am enjoying this weather otherwise! Cool! I might try that. I have made ones out of seashells found at the beach too. Just paint or glitter them and add a bow. What a great idea! I think I might have to try this and give them to the family as something from the boys. Merry Christmas!! What a great idea! Add that to my shopping list for December 26th – clear Christmas ornaments. I love this! We moved to a temporary rental this summer, and all the Christmas stuff is in storage. So I’m going to need something else to decorate with this year. These are so colorful and pretty! Thanks for sharing. They are beautiful. What a great idea. 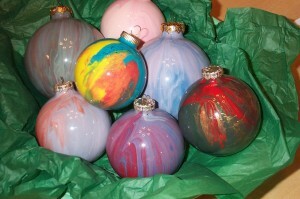 I have very similar ornaments on my tree that my kids and I made to use as gifts, many years ago! The grandparents loved getting something handmade, and I love remembering the time when my kids would still do crafts with me! Thanks for the memories! This is one craft I’ve always wanted to try, but I’m afraid I’ll get a little too enthusiastic with the swirl and end up with a bunch of poopy brown ornaments. And we all know nothing says “Merry Christmas” quite like an ornament reminiscent of…nevermind. LOVE this idea…. I have some left over glass ornaments from last year’s project. I think the kids and I now have a new craft to do this week! THANKS! 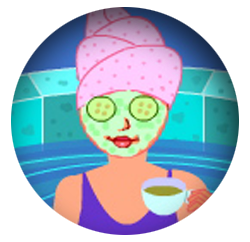 Very pretty and fun! Thanks for the idea.